The Don’t Delay, Connect Today campaign was implemented in Cyprus by a series of events which took place in Spring time 2018 and they peaked during the ‘’Awareness week for RMDs’’ organised in the second week of May by the Cyprus League Against Rheumatism (Cyplar) in cooperation with the University of Nicosia. 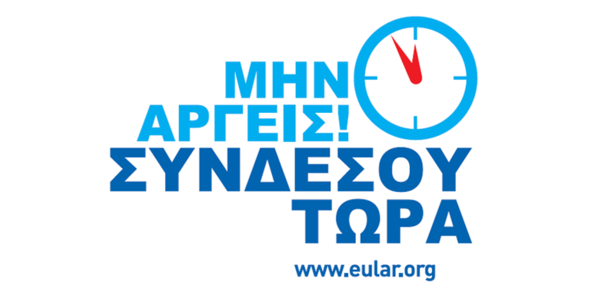 Through media and advertising the slogan Don’t Delay, Connect Today (translated in Greek) the public has been prepared for the campaign. At the second stage, the patient representatives, rheumatologists and health professionals attended media talk shows, TV and radio broadcasts and wrote articles in press in order to inform the public about RMDs and the importance of early diagnosis and access to the appropriate treatment. Policy makers were involved in a press conference and workshops took place during the Awareness week for RMDs across Cyprus. A Rheuma-Truck which is a truck/bus equipped as a mobile clinic, staffed with health care professionals was moving in several places in Cyprus to examine people. The truck was provided by the University of Nicosia and it attracted people’s attention with several happenings such as flash mobs, teaser videos and technical effects. An online survey was available for 60 days to explore the public awareness of rheumatic diseases and their symptoms. The aims of this campaign are to create awareness about RMDs to the public and involve the public, to encourage the people affected with RMDs to establish a good communication with their health care professionals, to lobby the policy makers, to implement measures and strategies such as the early arthritis clinics in order to promote the early diagnosis and early access to the appropriate treatment.